XTERRA is celebrating its 10th year of racing at Oak Mountain State Park on Saturday and this year the Southeast Championship in Shelby County, Alabama will double as the 2015 USA Triathlon Off-Road National Championship race. 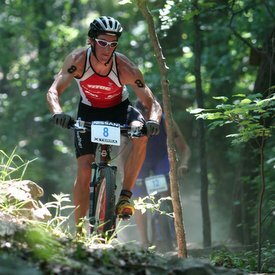 May 14, 2015 (Pelham, Ala.) – XTERRA is celebrating its 10th year of racing at Oak Mountain State Park on Saturday and this year the Southeast Championship in Shelby County, Alabama will double as the 2015 USA Triathlon Off-Road National Championship race. As such athletes will have the chance to be crowned USAT National Champions as well as XTERRA Southeast Champions. The race will also serve as a qualifier for both the 2015 XTERRA World Championship and the 2016 ITU Cross Triathlon World Championship races. Thirty elites will be racing Saturday, including the 2014 USA Triathlon Elite Off-Road National Champions Emma Garrard (Park City, Utah) and Josiah Middaugh (Vail, Colo.). The international elite field is highlighted by New Zealand stars Braden Currie, winner of the XTERRA Asia-Pacific Championship last month, and Olly Shaw, who was second at XTERRA New Zealand, as well as two-time XTERRA World Champion Lesley Paterson from Scotland, who won the West Championship last month in Nevada. Two-time USA Triathlon Off-Road Amateur Athlete of the Year Hannah Rae Finchamp (Altadena, Calif.) will also be racing, making her XTERRA pro debut and leaving the amateur title up for grabs. The very best amateur off-road triathletes from 40 states will also be competing on Saturday, including 12 athletes who are seeking to defend their USA Triathlon Off-Road Nationals titles from 2014. For the men’s field, those athletes are Greg Schott (15-19, Chesterfield, Va.), Justin McMurrer (25-29, Lehigh Acres, Fla), Rob Ricard (overall and 35-39, Berwick, Maine), Daryl Weaver (40-44, Lititz, Pa.), Jim Fisher (45-49, Midlothian, Va.), Ali Arasta (50-54, Asheboro, N.C.), Greg Seaman (55-59, Brighton, Mich.) and Charlie Redmond (65-69, Tenafly, N.J.). The men’s field also includes the likes of two-time 65-69 XTERRA World Champion David Rakita (Durango, Colo.), two-time XTERRA National Champion Peter Lilley (70-74, Charlotte, N.C.), Off-Road All-American Marcus Barton (45-49, Waxhaw, N.C.) and hometown favorite and former XTERRA World Champion Casey Fannin (55-59, Birmingham, Ala.). Reigning USA Triathlon Off-Road National Champions in the women’s race are Misty Becerra (30-34, Clermont, Fla.), Beata Wronska (35-39, Boynton Beach, Fla.), Stephanie Landy (55-59, Ballston Spa, N.Y.) and reigning XTERRA World Champion Linda Usher (65-69, West Upton, Mass.). Also competing for national titles in the women’s field are 10-time XTERRA National Champion Cindi Toepel (60-64, Littleton, Colo.), three-time XTERRA National Champ Lucia Colbert (55-59, Cordova, Tenn.), reigning 40-44 XTERRA National Champion Kathy Waite (40-44, Lakewood, Colo.), reigning XTERRA World Champion Kelli Montgomery (40-44, Wallingford, Conn.), and former XTERRA World Champion Mimi Stockton (40-44, Stevensville, Mich.). There will be 50 spots into the XTERRA World Championship to be held November 1 in Maui up-for-grabs. In addition, amateur athletes also will be competing for prized spots on Team USA for the 2016 ITU Cross Triathlon World Championships, the date and location of which will be announced later this year by ITU. The top 18 finishers (rolling down to 25th place) in each age group will qualify for a Team USA slot. Team USA is comprised of the nation’s top multisport athletes who represent the U.S. at each ITU World Championships event. Visit usatriathlon.org/teamusa for more on Team USA. The event is also the second of four regional championship races and will feature $15,000 USD in prize money for elite athletes, who will compete over a 1.5km swim, 30km mountain bike and 10km trail run. “The City of Pelham is proud of its relationship with XTERRA. We are equally pleased with the partnership we have with Shelby County and Oak Mountain State Park. In light of this exciting news, the city pledges to help bring an unprecedented and world class event to Pelham and Shelby County,” said City of Pelham Mayor Gary Waters. XTERRA will also offer a shorter distance sprint race – 750m for the swim, 15km mountain bike and a 5km trail run – as well as relay team opportunities; plus 5, 10, and 21-kilometer trail runs on Sunday, May 17. Oak Mountain State Park was honored as one of America’s best trail destinations in Runner’s World Magazine, where the twisting, rolling trails made the “Crown Jewels – 25 best trail runs in America” list. BUMP, the local trails advocacy group, has spent more than 100,000 hours in design and construction of new trails over the past 20 years. To complement the races, Oak Mountain offers a wealth of family activities from fishing to horseback riding, golfing to biking. Learn more at discovershelby.com. TEAM Unlimited is a Hawaii-based television events and marketing company, founded in 1988. It owns and produces XTERRA and in 2015 will offer more than 300 XTERRA off-road triathlon and trail running races in 25+ countries worldwide. In addition, TEAM TV has produced more than 300 adventure television shows resulting in three Emmy’s and 42 Telly Awards for production excellence since 1990. View samples at www.xterra.tv, and learn more at xterraplanet.com.